Inside, you’ll be welcomed with a smile. We’ve been in Uckfield for fifty years, a common port of call for local homeowners and painter decorators alike. We stock a good range of wallcoverings, trade and designer paints and a host of decorating essentials. If we don’t carry it, we can help you find it and will order it in for you. We’re good-humoured, cheerful and between us have a huge amount of product knowledge we’re only too happy to share. 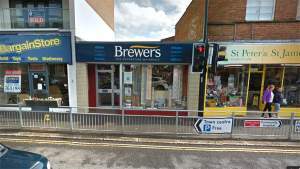 Uckfield Brewers Decorator Centre is right in the heart of the town centre, on the High Street by the traffic lights with Bell Lane. Customers visiting us in vans or cars can use our off-street parking; take the River Way turning opposite Bell Walk House shopping parade and follow the road round to our back entrance. Head south-east on Church Street, turning right to join High Street, follow this road and the store is located on the left. Head east on Bell Lane, take the second exit at the roundabout, follow this road and the store will be directly in front of you. Head north on High Street and the store is located on the right, opposite the left of turning Bell Lane.